Shortly after Epic Games released the patch notes for v8.30 earlier today, the Fortnite developer released a hotfix for the Team Rumble game mode, slightly altering the game’s structure and changing weapon and loot spawns. Originally released with Fortnite’s 6.31 update patch, Team Rumble is a battle royale limited time game mode that pits two teams of 20 people each against one another with a team deathmatch-styled objective: the first team to reach a certain number of eliminations wins the game. 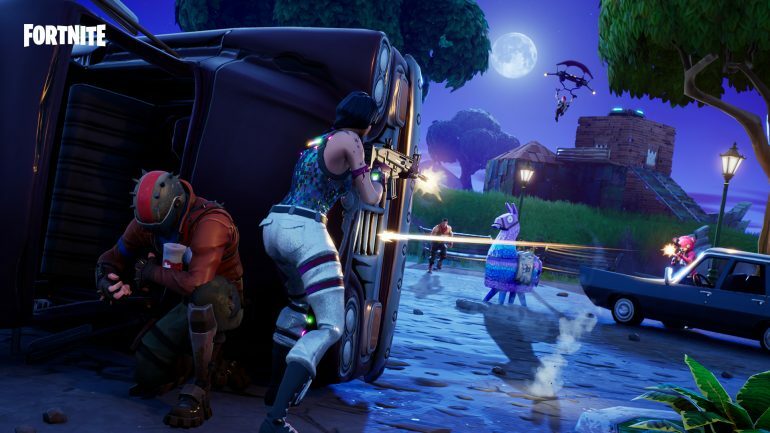 In today’s update, Epic Games increased the number of eliminations needed to win a match from 100 to 150. The size of the final circle’s radius has also been reduced to encourage more interaction in the late game. Similarly, the first circle’s duration decreased by a minute to facilitate more fighting early on. Looting has also changed, with loot increasing in chests and on floor from 80–90 percent to 100 percent. The chance of finding an assault rifle in chests has increased by 67 percent while the suppressed pistol spawn rate has decreased. Supply drops now drop two legendary weapons and additional consumables. The chance to find a compact SMG or shotgun have increased by 50 percent while rocket launchers are 67 percent less likely to drop in supply crates. Fortnite fans can find the full list of today’s changes on Epic’s official website.